Huge range of roleplaying games and accessories in stock at Spirit Games. It's a tense moment. Five people you thought were your friends are staring across a table at you. No one speaks while they wait for you to come up with something. If you freeze up now, you'll be at their mercy. No prisoners. No second chances. You've got the hardest job in the unvierse... you're the gamemaster. 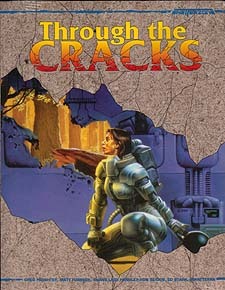 Suddenly, you reach for the Shatterzone supplement Through the Cracks. Before anyone can speak, you say confidently, "Okay, everyone, here's what we're gonna do..." It's good to be back in control.